I was asked some time ago by my girlfriends father if I could show him how to fish the pole so, when the chance came about I decided to take him None Go Bye Farm to introduce him to the world of pole fishing. We arrived at the lakes to a cold breeze and overcast skies. Having fished the bottom lake previously we both decided to fish the first and largest lake. We choose 2 pegs, one either side of a water inlet, I would be fishing into open water and Jeff would be fishing towards a small island about 12 meters away. After setting Jeff up with a silver fish rig and a variety of bait I set up and began plumbing up my own swim. Jeff was set up and ready to fish in a matter of minutes! Starting fishing at 9 meters yielded some tentative bites, but eventually the float dipped under and several scale perfect roach found their way to my net. The wind was making it difficult to fish the pole out at this distance, and after 20 minutes of battling the frequent gusts I choose to come in closer and fish the 2 margin swims I had begun to steadily feed. I was fishing using my top 4 sections. Feeding and using maggots as hook bait meant the fish were coming to the bank quickly, but there was no great size to them, so for more sport I switched to a lighter number 6 elastic. After an hour or so, Jeff had called me over to land a hybrid of just over 1lb. 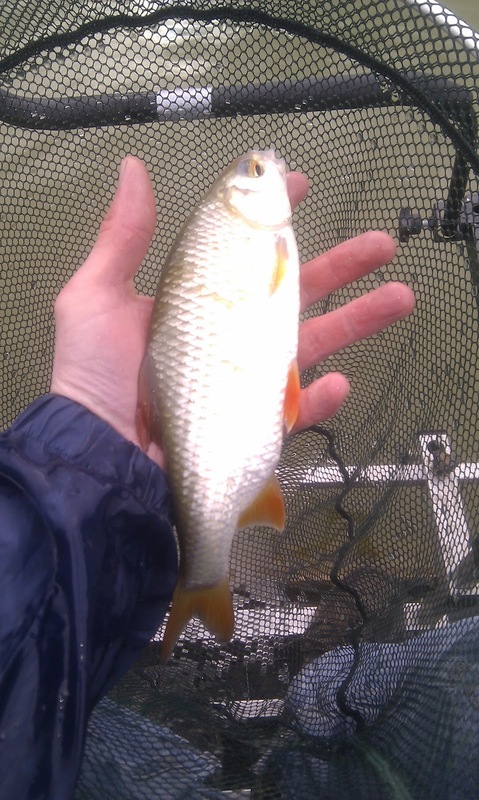 This was followed by a similar fish which fell to my double red maggots. It was then that I noticed the angler to my left had hooked a carp from the margin and was playing it excitedly while making some very odd noises (I think he was determined for everyone on the lake to know about his catch). With that in mind I swapped my top 3 to a heavier elastic and positioned my hook bait of meat close in at the margins and waited for my float to slip away. After 10 minutes I started to get a few small knocks, causing the float to dip, never fully submerging when the float finally disappeared as I struck. I knew it wasn’t a carp, but it was a nice hybrid of just over ¾ lbs. Switching sides from left to right meant fishing directly into the flowing water of the inlet pipe. 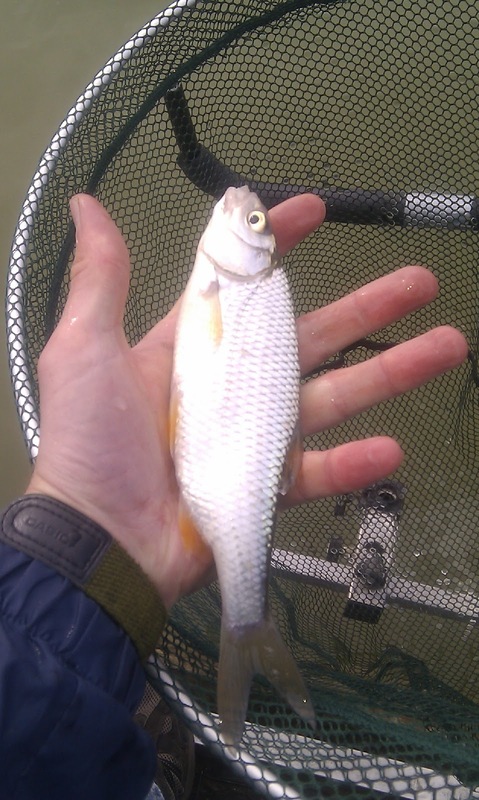 There the roach were feeding in full swing and the float vanished instantly, catching a fish of around 7oz. This continued for the best part of an hour and a half and meant I quickly accumulated about 10lbs of well conditioned silver fish. It seemed as though Jeff was having a similar time, catching roach and hybrid one after another. Catching the next fish was a complete accident. Having taken the landing net over to help Jeff land a fish he had been playing I returned to see that my rig and hook bait had fallen from my pole rest into the water an inch away from my platform. The float hadn’t reached the water but was hanging in mid air jerking from side to side. I picked up the top section to find a fish attached. 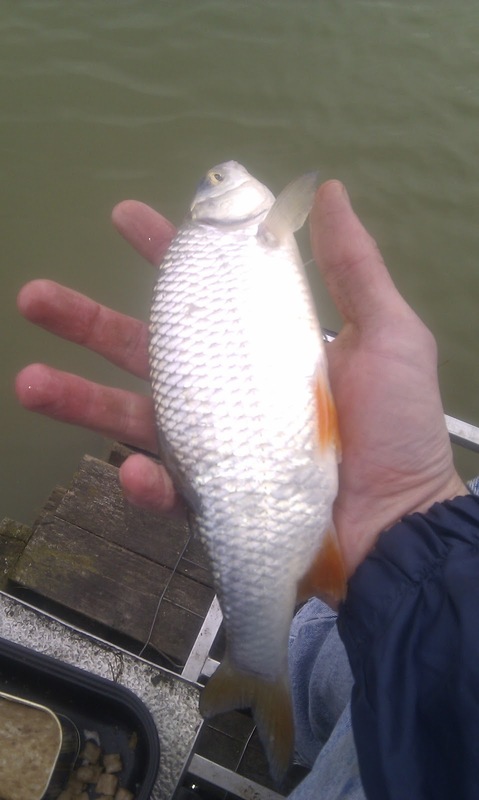 A roach of about 9ozs! For the remaining hour of the session I continued to fish inches from my feet with surprisingly good results. It also resulted in the biggest fish of the day. A hybrid of around 2lb falling to a slither of spam! It was a good afternoons fishing with roughly 20lbs of silver fish. If there had been less wind and it had been warmer we would have stayed on and fished into the evening but it was getting slightly uncomfortable sitting facing into the cool breeze. It would have been nice to catch a carp, as my previous trip to this venue was filled with them. But there was great sport to be had on the top lake from the silver fish, and I know there are numerous carp in the lake. I would recommend it to anyone who fancied a good days sport on the pole, waggler or feeder. If you are solely after carp I think you could also use the method feeder or pellet waggler to great effect! Next story Environment Agency Fishing Lists!